Welcome to the 2012 Digital SLR Buyer Guide - a broad overview of the latest digital SLR cameras, from entry-level to advanced. I’ve been writing and reviewing digital SLR cameras since 2005 and boy have I seen the technology come a long way since those early models. First and foremost is the addition of video capture to every new DSLR. All of the cameras that I list in this 2012 Digital SLR Buyer Guide are capable of capturing professional, high-quality movies. Massive progress has also been made in their low-light capabilities. Some of these cameras are capable of capturing spectacular images in near-dark situations. Flexible LCD screens have come a long way – they now bend and flip in all directions which is moderately useful for photography but immensely helpful when shooting video. Finally, the big new innovation in 2012 was the touch-screen LCD. Now you can take pictures, set autofocus points and change camera settings just like you do with your iPhone or iPad – just touch, swipe and pinch the LCD screen. Let’s kick off this 2012 Digital SLR Buyer Guide by introducing the most recent entry-level models you can get your hands on. Designed for those making the switch from a point-and-shoot compact or those who don't want to spend a month's paycheck on a camera, the basic DSLRs provide the benefits of an SLR camera – swappable lenses, optical viewfinder, fast autofocus – without adding a lot of extra bells and whistles. The lack of "bonus" features keeps the price on these cameras fairly reasonable, providing photographers with a digital SLR that doesn't require a trust fund to acquire. The first camera in this category is the Canon Rebel T3 1100D (released: March 2011). The thing that I like about this camera is that its video mode is quite basic. Not every person wants to take video with a DSLR, especially since it's not quite as easy and straightforward as using a regular video camera. Getting the camera to autofocus on a moving subject can be challenging. Since the video in the T3 1100D is basic, you can use the camera as a STILL camera and not feel too guilty about having spent a lot of money on a feature you'll never use. With a maximum speed of 3 photos per second, this is not the fastest DSLR on the planet, but it's WAY faster than many compact digital cameras. The 9-point autofocus will ensure that you don't miss a great shot because the camera is focusing. You can get a Canon T3i 1100D with an 18-55mm lens for $500 USD. 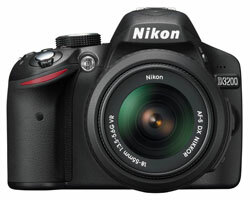 The second basic digital SLR to consider is the Nikon D3200 (released: April 2012). The big feature on this camera is the sheer amount of information that it captures per shot: a whopping 24 megapixels in each and every image. This number of megapixels means that you can print your photos at enormous sizes and you can also crop out huge portions of the image and still have a lot left over to work with. Like other digital SLRs in Nikon's entry-level category, the D3200 doesn't have its own focus motor. This means that older Nikon lenses and many third party lenses (those made by Tamron, Tokina and Sigma) won't autofocus when used with the the D3200. The LCD screen is improved over its predecessor (the Nikon D3100), providing a clearer and more colorful image thanks to its 920,000 dots (compared to 230,000 on the D3100). The D3200 is available with an 18-55mm lens for $597 USD. So – what do you get for a little more pocket change? Intermediate cameras are faster than the basic models, have more advanced autofocus for tracking fast-moving subjects and have robust video modes if you'd like to shoot high-quality movies. They also offer some "gee whiz" features that are either very useful (if that's how you take pictures) or just a total waste of money. 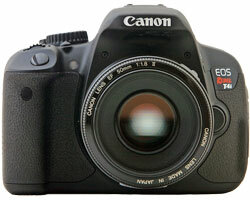 Let's start things off with Canon again, and talk about the Canon Rebel T4i 650D (released: June 2012). If you really want a digital SLR with a flexible touch-screen LCD, then this is it – the T4i is the ONLY digital SLR of 2012 to include such a feature. The flexibility of the LCD is useful for two reasons: 1) to take pictures at high and low angles and 2) to capture video. I found that I rarely held the camera at eye level to capture movies and having the flexible LCD allowed me to see it clearly at all times. The benefit of the touch-screen is more subjective, and depends on the types of devices that you use. If you are used to touching every screen you own, then a this LCD will be perfectly natural. If you are used to controlling a camera using knobs and dials (as I am) then the touch screen feels more like a gimmick. Some will be able to justify the additional cost for this unique feature, others will not. You can own a Canon T4i 650D with an 18-55mm lens for $950 USD. 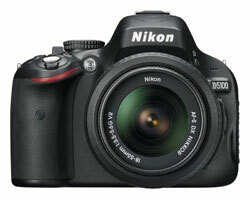 Like the T4i, the Nikon D5100 (released: April 2011) has a flexible LCD screen. The main difference between these cameras is that the LCD on the D5100 is for display only, no touch-screen here. Depending on how you look at it, this is either a HUGE drawback or not a very big deal at all. The D5100 is definitely not lacking in features, with a 4 photo-per-second top speed, 11 autofocus points, ISO up to 25600 and – for the first time in a Nikon DSLR – artistic filter that can be applied to any photo you take. The artistic filters provide you with some creative freedom, allowing to you apply Pop Art, Selective Color and High/Low Key effects (among others). I found that art filters can add flair to photos where the source material isn't exciting. The D5100 is available with an 18-55mm lens for $577 USD. 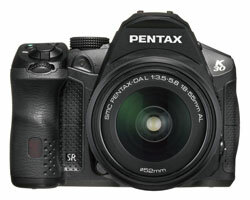 If travel is your thing, then consider the Pentax K-30 (released: July 2012). Its 81 seals prevent dust and moisture from getting inside and ruining the camera. Plus, you can also use the K-30 in very cold weather. Built-in image stabilization helps eliminate blur from your photos and a high ISO range paired with a fast continuous speed ensures that you don't miss the action. Like the Nikon D5100, the K-30 has in-camera art filter effects that can be applied to any photo. You can get the Pentax K-30 with a 18-55mm lens for $767 USD or body only for $690 USD. Finally, there's the Sony SLT-A57 (released: April 2012). The SLT-A57 utilizes a special translucent mirror to accelerate autofocus performance in live view mode. This special mirror also ensures that the camera can autofocus continuously and quickly in movie mode. The main drawback to the special mirror is that it replaces the optical viewfinder with an electronic one, which takes some getting used to if you've ever used an optical viewfinder in the past. The LCD screen on the SLT-A57 is completely flexible, which makes it much easier to capture videos from any angle. You can even flip the LCD around to capture self-portraits. The SLT-A57 is available with an 18-55mm lens for $800 USD or body only for $700 USD. If you're not entirely sure if you need an advanced camera, then you probably don't. Stick with one of the models listed above. The cameras below are for more experienced photographers who have very specific needs and uses for their cameras. Put another way, these cameras are designed to withstand the rigor of everyday use. If you only take out your camera for holidays, vacations and birthday parties then these are more DSLR than you really need. 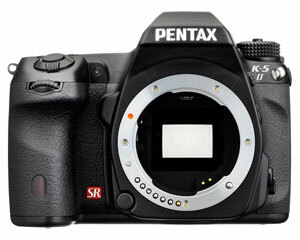 First up is the Pentax K-5 II (released: October 2012). Like the Pentax K-30, this camera is designed to keep taking pictures in all types of weather: sun, rain, sleet and snow. You can even use it in the middle of a sand storm if you really want. In addition to weather sealing, the K-5 II has an 11-point autofocus, a top speed of 7 photos per second and built-in image stabilization that works with every Pentax lens you can attach to the camera. The big improvement in the K-5 II over previous models is an autofocus system designed to track and lock onto subjects even in exceptionally dim light (after sunset, indoors at night, etc.). You can get a K-5 II with an 18-55mm lens for $1,275 USD. 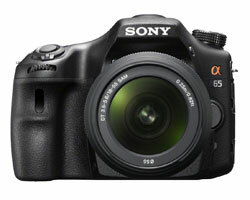 Next up is the Sony SLT-A65 (released: October 2011). The SLT-A65 isn't a "true" digital SLR since it doesn't have an optical viewfinder, but it's pretty darn close. By removing the glass mirrors that are used for digital SLR viewfinders, Sony was able to substantially increase the performance of the A65. The camera is able to autofocus quickly whether you are using the viewfinder or the LCD to compose photos and it can autofocus continuously during video capture (many other cameras do have movie autofocus, but it's slow to respond). It can also capture photos at a sustained rate of 10 per second, significantly faster than even the fastest digital SLRs. Sony tops off all this speed with a fully flexible LCD screen and a high resolution electronic viewfinder. 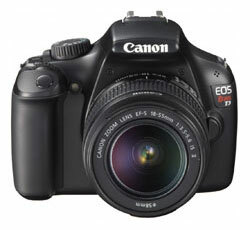 You can get this SLR-like digital camera with an 18-55mm lens for $1,000 USD or body only for $900 USD. I'll wrap up this 2012 Digital SLR Buyer Guide section on digital SLR cameras with some information about full frame. A full frame digital SLR has a sensor inside it that's the exact same dimensions as a frame of 35mm film. It's physically larger than the sensor in all other DSLRs. This larger sensor provides three main benefits: 1) a wider angle of view, 2) shallow depth of field / blurrier backgrounds and 3) superior image quality even in very dim available light. Prior to 2012, full frame DSLRs were extremely expensive. No, I'm not ready to run out and buy one just yet, but two full frame cameras released in 2012 show a reduction in price that is promising. 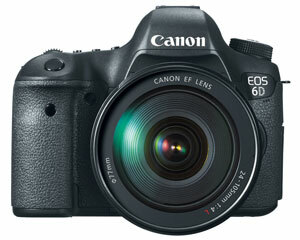 The first is the Canon 6D (release: December 2012) with a list price of $2,100 USD for the body only, no lens. While this is still pretty expensive, it's much less than other full-frame DSLRs. The ISO range on this camera is phenomenal: from a low of 50 to a high of 102400. At the maximum ISO, the 6D practically sees in the dark – you may never need a tripod for your camera again. Actually, you will need a tripod or some other form of support if you want to use the 6D to shoot your next YouTube masterpiece. The video quality of this camera is exceptional but – like the rest of its features – a lot of skill and experience is required to achieve a "feature-film" look. You can also shoot professional-looking video with the Nikon D600 (released: September 2012) which is comparably priced to the 6D at $2,100 USD without a lens. Full 1080p video is at your fingertips along with customizable frame rates and manual exposure controls. Those who want superior audio can plug in a microphone and monitor the sound captured using headphones. 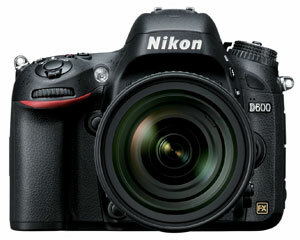 The D600 is quite large and hefty, weighing in at 26.8oz (760g). Once you attach a decent lens to the front, it's a workout to carry it around for a full day. But the workout is worth it once you engage the 39-point autofocus system to lock on to a subject zipping by. To capture especially skittish creatures - or small children - you can leverage the 5.5 photo-per-second continuous speed. Simply put, there really aren't that many photographic subjects that the D600 can't handle. Landscapes, portraits, wildlife, sports...regardless of your photographic passion in life, the D600 can help you capture images that match your vision.